Frostborn by Lou Anders. Book 1 in the Thrones and Bones Series. Review: Have you ever felt like a misfit? 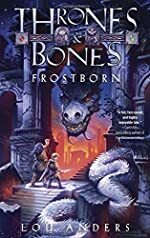 In Thrones and Bones Frostborn by Lou Anders, Karn and Thianna are misfits in a Viking-type setting where there are fantasy characters such as giants, trolls, and dragons. In this book, Karn and Thianna experience a great adventure! In Thrones and Bones Frostborn, the two protagonists, Karn and Thianna, feel like they don't belong. Karn is the oldest in his human family, so that means that he has the responsibility of one day running the family farm. All he really wants to do, though, is play a board game called Thrones and Bones. He despises the thought that one day he will have the responsibility of running the family farm. Thianna lives in a village of giants, but the only problem is that she is half human and half giant. She is only 7 feet tall. That is huge for a human to be 7 feet tall, but not for a giant. She is about half the size of most giants in her village. In this book, Karn wakes the undead, people come after Thianna and her magical horn, and they meet an enormous fire- breathing dragon named Orm. They find themselves together, struggling to stay alive while protecting a magical horn Thianna's mother stole from someone many years ago. I adored this exciting, suspenseful book. The author's writing style reminds me of Holes by Louis Sachar. I could not stop reading Thrones and Bones Frostborn. The author used great description in this book such as this passage that appeared on page 11, ÒThe giant glowered down at her over a large bulbous nose and bushy blond beard.Ó There is also phenomenal vocabulary such as, "glowered...bulbousÉ" from page 11. The reader could probably draw a picture to go along with every page. In my opinion, this book is suitable for both girls and boys. The author included dragons for boys and snow spirits for girls. I loved every part of this book, but people who do not enjoy reading about magical creatures might not like this book very much. I believe this book is for ages 12 and older because the writing style would be a little too hard to understand for a lower level reader. Also, I would recommend it for ages 12+ because of the complex vocabulary. In conclusion, Thrones and Bones Frostborn is a perfect combination of suspense and action. Review written by Calden (6th grade student). We would like to thank Random House for providing a copy of Frostborn for this review. Have you read Frostborn? How would you rate it?